‘Atmatirtha’ – This sacred book deals with the life and teachings of the greatest Acharya of Hinduism – Sri Sankara Bhagavadpada. This is not a historical biography of the Acharya but is a magnificent independent Vedantic epic. While unraveling the life of the great Master, sparks of profound spiritual insight flash forth. The Majesty of the teachings and the glory of the teacher open the sluice gates of deep peace and give the glimpse of our true nature. In the course of narration, the doubts that a seeker may have, regarding Vedanta and spiritual practices, are clarified. A devout reader of this text is sure to have the experience of a sacred pilgrimage along with the elightened Sage, from Kerala to Kedar. Bhakti, jnana and vairagya seep into one’s heart while absourbing the divine life. In this, the divine story of the Acharya is freely rendered. More than facts, the highest goal, Self-realisation is always kept in the background of the subject matter. This indeed is the story of spiritual India, the story of Sanatana Dharma. Sri Venkataraman is an Acharya of Vedanta. He resides in the holy Arunachala (Tiruvannamalai). He was born in Nochur village in Palakkad (Kerala). Brought up in an orthodox Vedic tradition, he had profound exposure into Vedanta jnana at the tender age of fourteen itself. His talks and writings on jana and bhakti have already made him a legend. 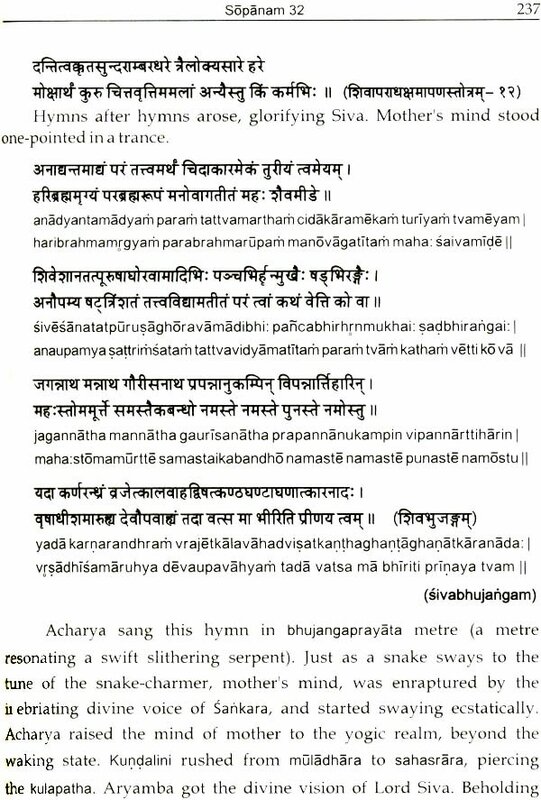 'Atmatirtham'- This divine independent work on Acharya Bhagavadpada, in whom all the great sages of all times, meet and merge, is a pilgrimage to the sacred and timeless spiritual inheritance of India. This is not a simple biography but a profound Spiritual classic having a bio-graphical framework that serves as a structural device. It is an independent excursion into the sacred life of Acharya and his teachings. For the same reason more than factual details it is the fragrance of atmajnana that inspires the readers to reflect afresh and contemplate upon the eternal Truth. As Bhagavatam is Sri Krishna Himself, Atmatirtham is truly Sankara Himself. Dakshinamurthi out of infinite compassion left his mouna and descended in the form of Sankaracharya to restore Sanatana dharma from the pitiable situation into which it had fallen. In the form of Adi Sankara, He journeyed across the whole of India on foot to remove the darkness of ignorance. In our times Bhagavan Sri Ramana Maharshi lived with the same glory and light. Sri Nochur Swami is a Spiritual teacher who has come in the lineage of Bhagavan Sri Ramana and Sri Sankaracharya. Through this unique composition, the sagely author leads the devotees and seekers to an inner digvijaya of jnana. This is indeed a holy Prayag - confluence of bhakti, jnana and vairagya - transforming all those who take a holy dip in it. As one reads, the words disappear, leaving us astonishingly still in the divine Presence! This is an incomparable contribution to spiritual literature, carrying the fragrance of Truth experienced by the author himself. A worshipful dip in these sacred waters will certainly purify us and grant the insight to get a glimpse of the Self. Drink deep the sacred nectar of Truth and life will never be the same again. Adi Sankaracharya's name is known all over India as the greatest of the Acharyas and saviour of Hinduism or Vedic dharma. Quite a few might also know that it was Sankara who preached Advaita or Non-duality as the principal teaching of the Upanishads, along the length and breadth of India, many centuries ago. However, the fact is that like all great men, especially great spiritual teachers, Sankara, the man and Sage, remains unknown. The chief cause for this obscurity is the silence of the enlightened ones about their personal lives and their transcendental state. There are people, even among sannyasis of the Dasanami Order which owes its origin to Adi Sankara, who know Sankara as only a colossal intellectual, an invincible debater and a dialectician par excellence. A great Swami, a profound admirer of the Acharya, once described Swami Vivekananda as a fusion of Sankara's intellect and the Buddha's heart. Readers of this book are sure to find Sankara's heart as vast and deep as his intellect. Often the phrase 'Hridayam viswam asya- 'his heart is infinite like the universe I occurs In this book while describing the great Master. It is this aspect of the book presenting Sankara as much as an ocean of compassion and love as a mountain of wisdom which impresses most. 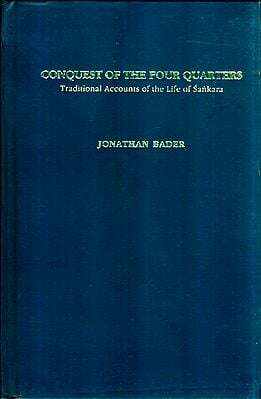 In this book Sankara appears as a mighty spiritual teacher least interested in winning debates or displaying his genius. He knew the Truth, the Advaitic Truth and he walked and walked and talked and he walked his talk. He preached the Truth which he lived. Mere logic, however brilliant, cannot go very far in the spiritual domain. It was his total inner purity, power of Realization, fearlessness and love for all which could bring all the sects that have strayed away, back to Sanatana Dharma. It would seem that this is the first book in any language on Sankara's life which presents the Preceptor Extra-ordinary's life and teachings widely quoting his own words. Gifted with a panoramic view of Indian spirituality and profound knowledge of Vedanta, Sri Venkataraman aptly places Sankara's heart-melting devotional hymns on various forms of God and Vedantic utterances in right contexts throughout the book and as one turns page after page, one's knowledge of Vedanta and understanding of Sankara deepen. Sankara's devotional hymns shine like jewels on his radiant Vedantic crown of jnana. The author wisely avoids controversies like the period of Sankara, establishing of mutts, miracles which defy belief, the manner of the end of the avatar etc. 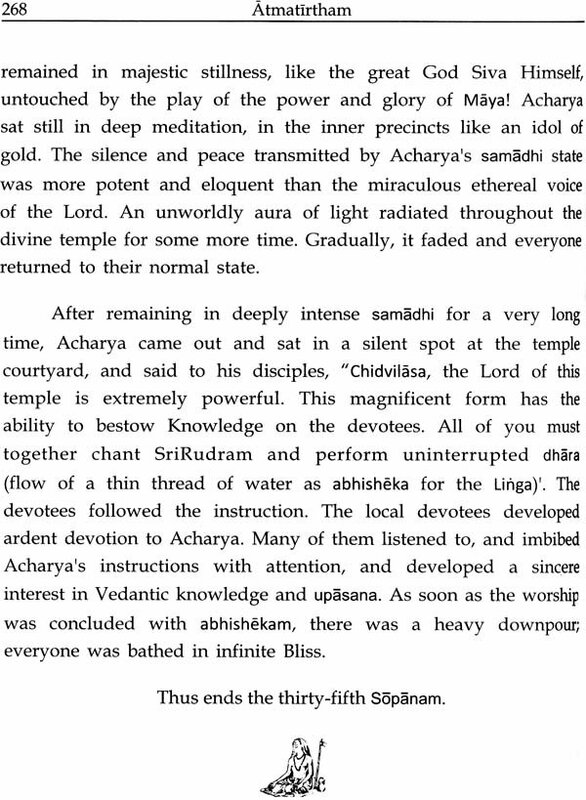 However the real miracle of the Acharya's life and his tireless teaching of Self-knowledge are brought out perfectly. Backed by deep spiritual insight, written with great devotion, in a simple, elegant style, with a generous sprinkling of illustrations and a map of the period, this book is beyond doubt the most complete one on the life and teachings of the JagadGuru. 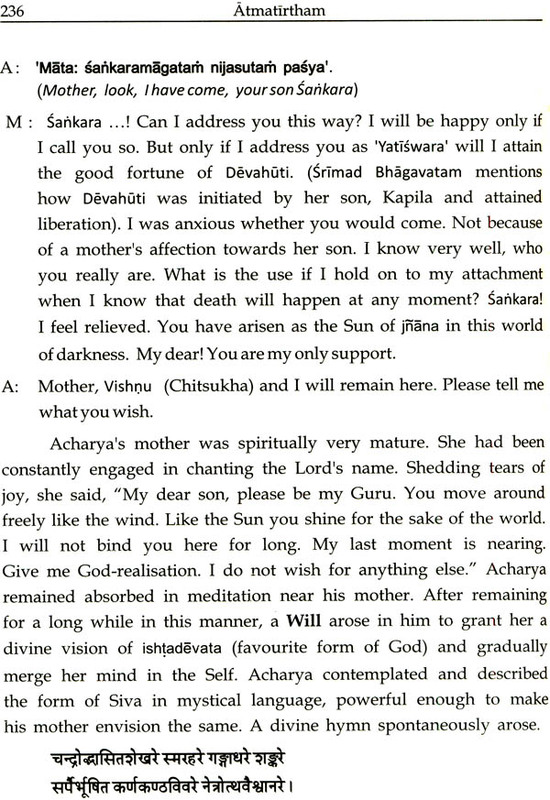 We are presenting this Vedantic text - 'Atmatirtham. 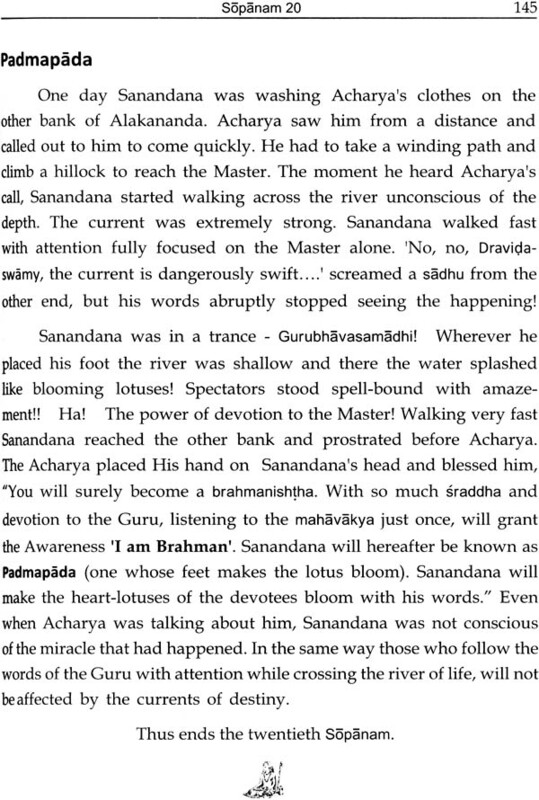 This name itself has been taken from Sri Sankara Bhagavadpada's Vedantic text, 'Atmabodha'. 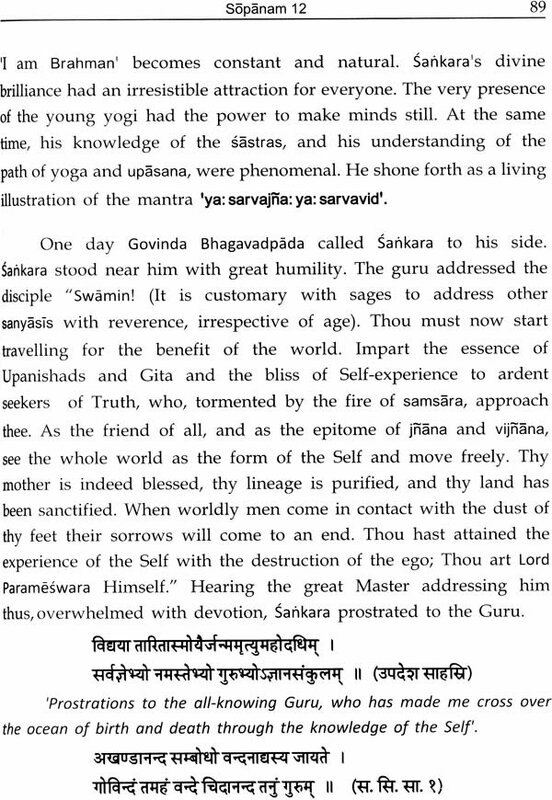 Sankara Bhagavadpada is the quintessence of all the Avataras and Rishis in the spiritual history of India. There is absolutely no doubt that the foundation of the Hindu religion as it is today, is Acharya himself. This is an undeniable fact to anyone who studies Indian history without prejudice. From the works of Acharya, very little biographical details are available to us. 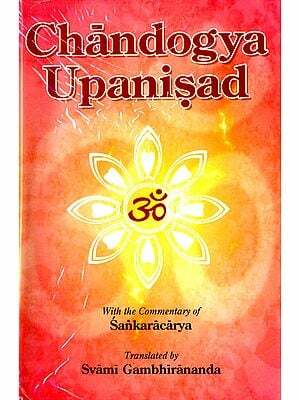 What one can gauge about Bhagavan Sankaracharya from his own works is that, he is ever the unborn Brahman. Acharya's direct disciples also have extolled the Master as Lord Siva and as the all-knowing Sage. Some of them have merely alluded in their works that Acharya's birth took place in the Dravidian land. 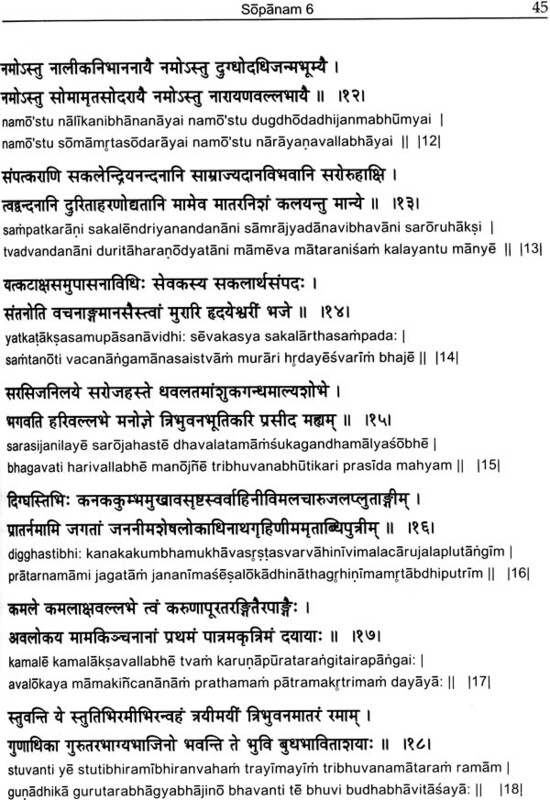 What we have obtained as the life history of Acharya include the Sanskrit works - Brihat Sankaravijaya, Prachina Sankaravijaya, Vyasachaliya, Anandagiri Sankaravijaya, Chidvilasiya, Madhaviya Sankaravijaya, Sankarabhyudava, Bhagavadpadabhyudava, Sankaravijavarnakaranda and Govindanathiva (Sankaravijava from Kerala). 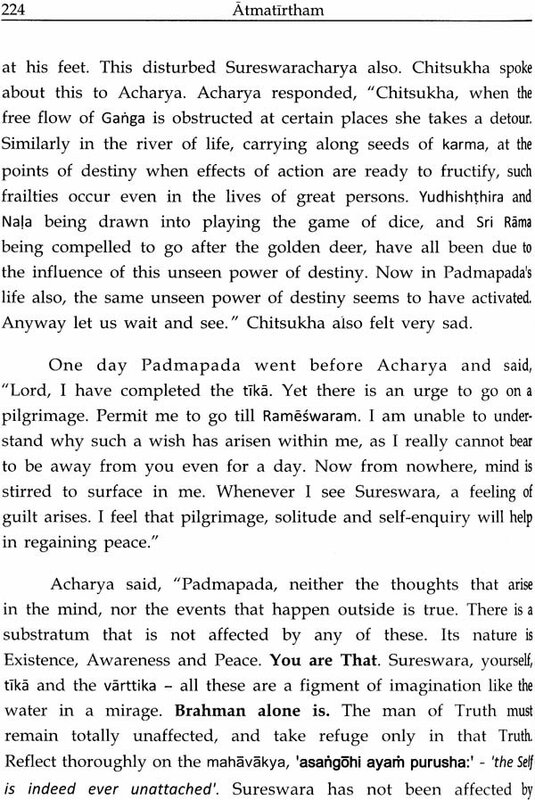 Sri P. Seshadri Iyer, one of the few direct disciples of Swami Brahmananda (Sri Ramakrishoa's dear most disciple) has condensed the essence of all these in the small but beautiful book, 'Sri Sankaracharva charitam'. 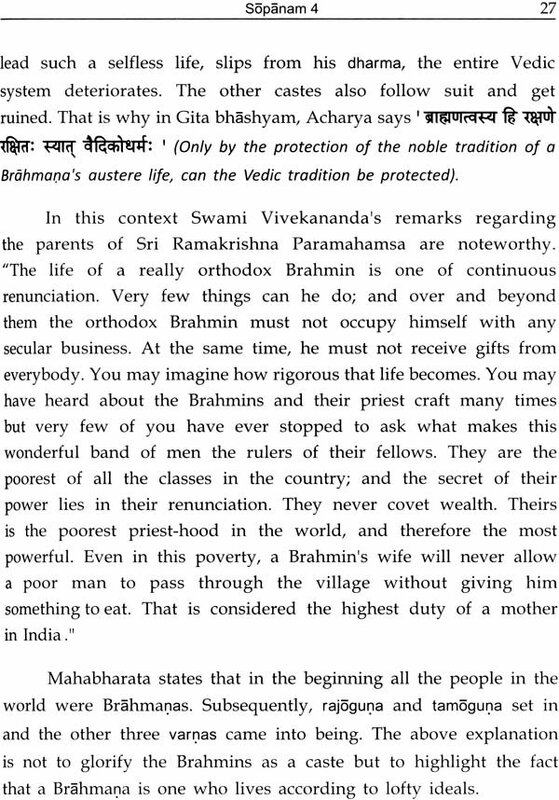 This is a Malayalam work published by Sri Ramakrishna Asrama. This very book has been a vital point of reference for this divine work, 'Atmatirtham'. Main sources for this Atmatirtha are Acharya's own bhashyas, prakarana-grantnas, statras, the works of disciples, and the stories narrated in Sankaravijayas. This holy work is to be considered as the direct form of Acharya himself. This is the history of Bharatha and its culture. Those who read this, will certainly be convinced of its divine origin. This work 'Atmatirtha' is not a simple biography nor is it a research thesis. This is not a historical narration either. 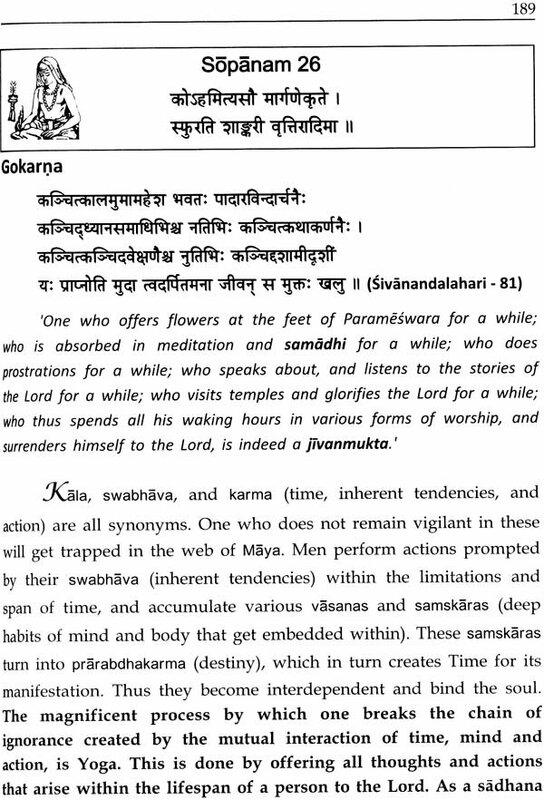 This is a Paramahamsa Samhita soaked in Vedanta rasa. This has to be read with utmost reverence and devotion. Certain incidents and narrations in this work may vary from those of other Sankaravijayas and biographies. These differences are brought about with the firm evidences from Sruti, yukti, anubhava and the words of Rishis. Sankara indeed is the glow of Divine Awareness that happens in the heart-cave of the readers of this sacred book. The same Sankara is behind this pen too.